Hot! Hot! Hot! You’d think I’d welcome the mercury’s rise past the 60s. But my quick business trip to Phoenix was a rude awakening – 103 already! Where’s my happy compromise, say, 80? Oh, that’s right. I’m missing the best day of the year so far in Portland, while I sweat it out here in Phoenix! Enough whining, but isn’t it ironic, don’t you think? It’s worse than a black fly in your Chardonnay. It’s like a hot hashcapade in the Phoenix shade! 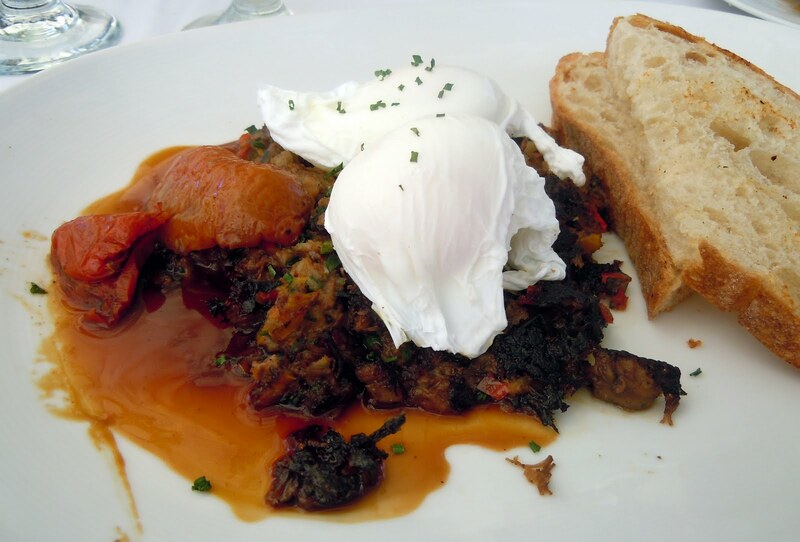 And thus begins my visit to Lon’s at The Hermosa Inn in Paradise Valley for their Short Rib Hash. Unfortunately, Erik was unable to make it. He had continuing education for his massage therapy license, which he doesn’t need anymore (ironic). Happily, I was able to meet Jen and her two boys, Noah and Kaleb, but only after getting lost, even though my rental car had GPS (ironic). 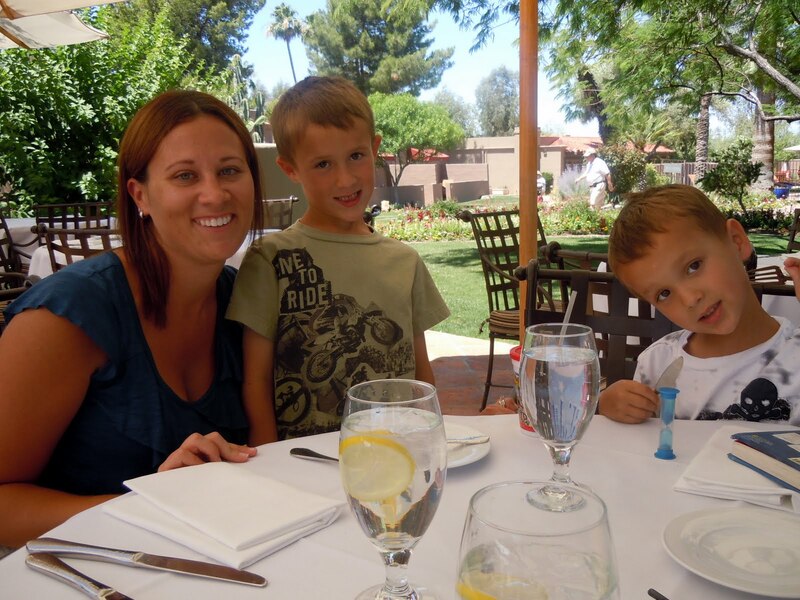 We ate al fresco on Lon’s patio with the soothing sound of water flowing from a fountain nearby. I could almost feel its cooling influence lower the temp a little bit! 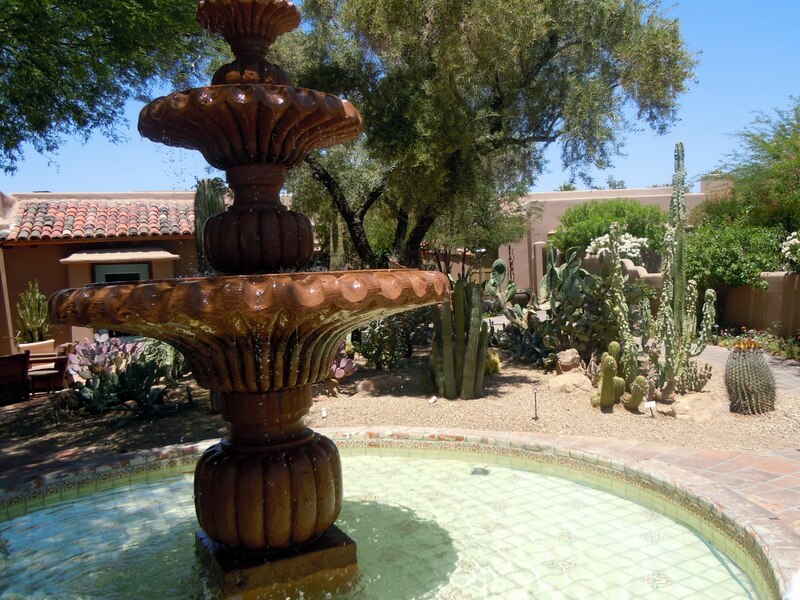 Desert cacti stood like sentinels guarding the fountain, separated by the pathway that ringed it. A little oasis for our hashcapade! By the time my Short Rib Hash arrived, I was more than starving and quickly soaked in the presentation. Wait, where were the potatoes? Had they been hijacked by the carb police? Hash without potatoes (ironic). But then I realized I was in the realm of conquistadors from ages ago. Their version of hash, picadillo, has no potato! No problemo! Delicious, succulent hashed short ribs, accompanied by red and yellow diced pepper, roasted tomatoes, a reduction sauce and two perfectly poached eggs disappeared in minutes. I’m pretty sure Jen thinks I was raised by wolves! As I write this post at the airport, I’m in my air-conditioned cocoon, staring out the window, thinking of the ultimate irony – over 4 million people, living in a desert. Isn’t it ironic, don’t you think?